Hello everyone! The Romance Studio will be hosting a Thanksgiving Party (online) in which authors will share with fans their books, videos, and maybe even excerpts from upcoming works! Did I forget to mention that there will be prizes given out by multiple authors? It's a great chance to learn about new books, chat with authors, and maybe even win a prize. Hello everyone! I have some exciting news to share. 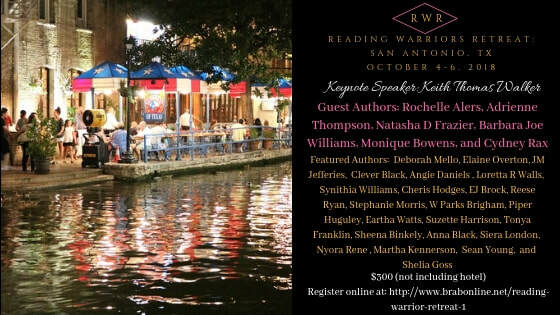 I have been invited to be a featured author at Building Relationships Around Books A Reading Warriors Retreat! It will be from October 4th - 6th at the Embassy Suites Hotel in San Antonio, TX. If you are interested in going, go to www.brabonline.net to register. The cost is $300 (not including hotel). There will be a lot of great authors in attendance (check the flyer above) so you don't want to miss out on the opportunity to hang out with them and pick their brains about your favorite books and characters. Also, we will be collecting school supplies to donate to an elementary school in Houston. Come on out and get your books autographed. I hope to see you there! Love Rekindled was my debut novel and I thoroughly enjoyed making Malcolm and Charmaine's love story come to life. I currently have plans to re-release Love Rekindled later this year, as well as Drew and Denise's story and Jacob and Lena's. I've been busy writing and I can't wait for you to read about them! I enjoy hearing from and interacting with you so be sure to hit me up! Also make sure to subscribe to my emailing list and follow me on social media so that you'll know when the pre-orders are dropped. In the meantime, while I'm writing, I hope that you're enjoying and embracing life, positivty, and continuing to pursue your dreams. Thanks again to all of you for making Love Rekindled an Amazon top 20 bestseller and for your continued support. I've been thinking about writing a blog post for a while now; one centered around women and taking care of ourselves. What immediately came to mind was: black women are S.U.P.E.R.W.O.M.E.N; yes, it's a long acronym, but bear with me. Black women are Saving, Uniting, Preparing, Encouraging and Raising Warriors whose Origins come from a Melanated, Educated Nation....and that's a vital part of our continued survival. Think about that for a moment. We are superheroes. That's something that can oftentimes get lost in the day to day hustle and bustle of life. It can sometimes feel as though we carry so much, that we have a great responsibility towards the next generation...and the truth is: we do. We do all of this and sometimes without a single thank you or a gesture of appreciation. We march, campaign, and fight for our boys, significant others, fathers and brothers. We raise our children the best we can. We go to work and oftentimes make less than our counterparts. We cook, clean; we hold it down. In the midst of saving lives, adverting disasters, and just being awesome we tend to forget about ourselves. We neglect ourselves in favor of taking care of others. Those last couple of dollars we had tucked to the side for a pedicure go toward our child's school supplies. That book that's been on our to be read list, has been there for months, maybe even longer; because we can't seem to find the time to get around to reading it. That gym membership we got with the intention of losing those last fifteen pounds, hasn't been used because whose going to watch the kids, do the cooking and do the cleaning? By the time we're done taking care of others, we're too tired to take care of ourselves. It's important to note that while our duties as mother, wife, daughter, sister, friend, and all around superwoman are extremely vital to helping the next generation become successful and self-sufficient; our most important duty is to ourselves. It may sound selfish, but if we don't take care of us who will do all of the important work that we're currently doing? Who will raise our daughters to be strong women? Who will build up our sons? March and fight for our babies? Now, this in no way bashes men or diminishes their contributions to the family unit; however, with everything that our men are currently facing; they need us too. We can't operate at maximum efficiency if we don't take the time to take care of our physical, mental, emotional and spiritual needs. If we neglect us, we can turn into the very thing we despise: someone who is full of negativity and pessimism. This type of person is not a productive one. If we want to make a difference and be leaders and agents of effective change, we have to make sure we are straight. Sometimes this may mean unplugging from social media. It may mean distancing yourself from people who are negative. You may have to take time for yourself, even if it means that something on your never ending to do list doesn't get done. It's aslo important to remember that when you do these things, others may not agree with the way you do things. They may complain about not hearing from you or criticize you because you decided to rest instead of do yet another batch of laundry. But remember this: people will always have something to say about how you choose to do something. You can't please them all and truthfully, you shouldn't really try. When we fall into the trap of people pleasing, we also fall into the wasteland of unhappiness. We lose ourselves trying to please others. This is why it is so important to take time for yourself. Take the time to recharge, it's vital to your stability and to those who depend on you. Another side note: there's a difference between those depending on you and those who expect you to please them. My child depends on me to take care of her, to provide love, shelter, clothing, food, and guidance...now whether or not she's happy with the clothes I bought her is another thing. It doesn't matter if she's upset because she got a purple unicorn shirt instead of the pink one, the most important things are: Does it fit? Will it keep you warm or cool? You see, I provided a need without getting caught up in the pleasing. Another thing that is important to do is to surround yourself with women who are positive, who are go getters. It's important to form a close inner circle that can serve as your support group. A group of friends who are your confidants, your support, your conscious and your compass. These are people who you trust. They are like minded people. This is crucial to your sanity because they will hold you down. Why? Because they too understand the struggle. Take a mental health break daily. Close your eyes, get in your comfort zone and free your mind. Empty it of all the negativity and toxicity. You may have to sit in your car in the garage to find that quiet time. You may have to take that time while in the shower. No matter how you have to do it, make sure you do it. Get enough rest. Notice I didn't say get some rest, but enough rest. As women, we'll get four or five hours of sleep and think that we're golden. No, we're functioning...but it's not at peak capacity. In other words, we're doing just enough; but not enough to be effective. Take care of your health...this is directed towards myself too! That saying our health is our wealth is very true. We can't help others, if we're not well. You don't have to be thin to be healthy; but regular exercise (even if it's just parking farther in the parking lot or walking in place during commercial breaks) is important. Eating healthier is a must as well. Incorporate more fruits, veggies, and water and less junk food and soda is important and can improve our overall quality of life. If you're able to, try to plan a sista girl getaway with your inner circle. Yes, I know money may be scarce; but the getaway doesn't have to be somewhere expensive or even far. A major city near you or a beach near you may be something within reason. For example if you live in Houston, then a trip to San Antonio or to Galveston may be affordable. It's a few hours drive and you can go half on a hotel room with your girls. It's nice to stay in fancy hotels, but let's be real...if you're going on a trip, you're only in your hotel to sleep; so don't break the bank on the hotel. I'm not saying get a crappy one; but a hotel that's clean and has the amenities you're looking for is most definitely an option to consider as opposed to a high dollar hotel. If that's not within your budget...then do a staycation. Take one day in your city. get a hotel room, massage, manicure and pedicure...and then close yourself off in your room to read, sleep, or just think. No kids, no significant other; just you and your thoughts. You'll be amazed how recharged you feel after your staycation. And above all remind yourself just how awesome you are. In a society that oftentimes diminishes just how fabulous we are; it's important to look yourself in the mirror and say, "damn girl, you're awesome!" Put notes of affirmation on your mirror to look at first thing in the morning while you're brushing your teeth. Put a note on your dashboard in your car, in your lunch bag, and on your desk at work or home. As women, we need these little reminders to keep us encouraged. Our duty is to build a nation and in order to do that we must take care of ourselves. In essence, we are our most vital resource and our well being should be a priority. So the next time you see fellow S.U.P.E.R.W.O.M.E.N. give them a compliment, a smile, and a "You rock!" because we do! Author of a upcoming book series.